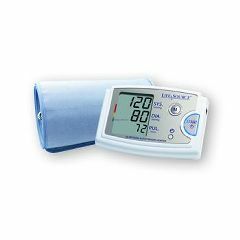 Extra large arm blood pressure monitor has a high performance motor and the AccuFit Extra Large Cuff, contoured to fit arm sizes 16.5-23.6” (42-60cm). LCD display shows time, date, blood pressure and pulse, with a Pressure Rating Indicator that lets you know what these readings mean. Features irregular heartbeat detector, 60 memory recall and HeartWise technology that insures a more comfortable measurement. Includes information manual in English, French, and Spanish and 120V AC adaptor (or operates on 4 AA batteries, not included). Lifetime limited warranty. Keeping track between. doctor visits.